The British School Jakarta is proud to host the 11th Annual Bursars’ and Business Managers’ Conference for 2018/19. The theme of the event this year is “In quality we trust”. Kindly refer to the conference flyer here and final programme here for further details. Registration is now closed, all delegates who are registered are kindly requested to ensure final payment is transferred no later than 5 April, 2019. We look forward to seeing you in “Wonderful Indonesia”. International School Brunei (ISB), long-standing member of FOBISIA, took great pride in hosting the 9th Annual FOBISIA Bursar / Business Manager’s Conference at their new campus, 26th – 28th October. The tone of the conference was set at the opening dinner when ISB’s Deputy Board Director, Mr Nick King, outlined the importance of the Business Manager’s and associated roles in comprising the administrative back-bone of international school operations. He expressed a specific hope that the coming together of so many specialists from international schools in Asia, promote an air of openness and cooperation, enriching each delegate’s skillset and knowledge base. International schools can help each other to showcase best practice in the myriad of operational processes associated with such complex and diverse organisations. Over the three days, there were a wide range of issues discussed and debated in the open-forum round table sessions. Each topic was introduced by a presentation, from one of the delegates, on the strengths and weaknesses of their school’s own strategy in the topic areas of interest, requested in advance by the delegates. The 8 issues tabled over the two-day conference were the management of: Finance, Human Resources, Admissions& Marketing, ICT, Health and Safety, Facilities, Boarding and Community Engagement. There was also a special presentation on School Security & Crisis Management by Mr Lonny Muller, Regional Security Officer from the US Embassy in Brunei. He emphasised that good communication, planning and practice were the best ways to prepare for crisis and concluded with a briefing on current trends in international school safety. As well as the work involved with the conference, delegates were also able to relax. Highlights included a visit and meal to the Empire Hotel, one of the world’s most expensive hotels and a trip down the Brunei River to sightsee the rare Proboscis monkey and the water village, site of the first habitation in Bandar Seri Begawan, Brunei’s capital city. We look forward to new learning opportunities from another FOBISIA school who will be hosting the 10th BURSAR/ BUSINESS MANAGERS’ CONFERENCE next year! The 2016 FOBISIA Bursar/Business Managers' Meeting will be hosted by the International School Brunei from 26th-28th October 2016. Please see here for the draft programme of the conference. 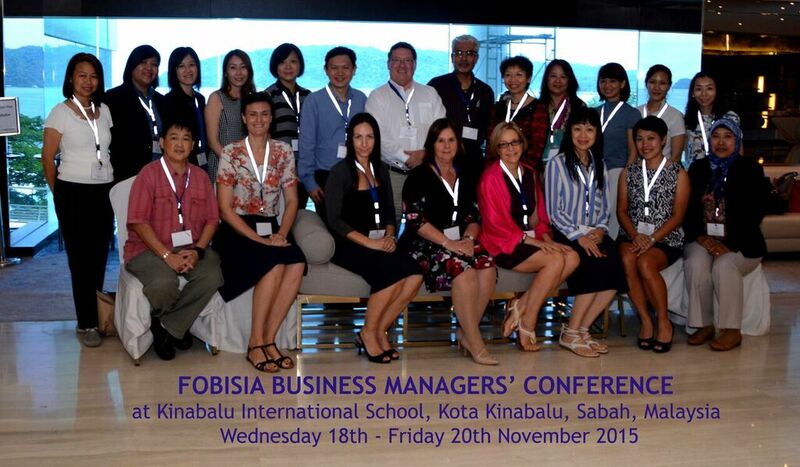 The FOBISIA Business Managers’ Conference 2015 was hosted by Kinabalu International School, Kota Kinabalu in 18-20th November 2015. A welcome dinner for the delegates being the customary icebreaker was held on the evening of Wednesday 18 November at the Le Meridien Hotel, where our Vice Chairman of the School Board of Management, Mr Christopher Garside, welcomed the delegates from the various FOBISIA schools around the region, speaking on the theme "Good Soil for the Growing Trees". All the delegates attended a one and a half day conference at Le Meridian Hotel over the next two days. This year’s programme was focused on open discussions and sharing of best practices, which seems to be most popular with participants, to include a presentation by Mr Leong Kok Liang, Director of Finance from The Alice Smith School on the topic “Technology Financing – The Leasing Way”. The boardroom discussions were based on the specific needs of participating International Schools and sharing on new ideas that can be cost effective and help schools stay in line with the latest technology, which the delegates had put up earlier for discussions. The delegates were also challenged with a 15 -minute walk after dinner on the second evening to the observation platform which is located at the highest point in Kota Kinabalu city, which gave a bird’s eye view of the city. The 8th FOBISIA Business Managers’ Conference 2015 will be hosted by Kinabalu International School, Kota Kinabalu, Sabah, Malaysia at the Le Meridian Hotel from 18th to 20th November 2015. As agreed at the previous Conference, November is the preferred month to hold this annual meeting instead of September. This year’s programme is focused more on open discussions and sharing of best practices, which seems to be most popular with participants. Brief Itinerary is as follows:- Please see the full programme here. Kinabalu International School, Sabah, Malaysia will be hosting the next Bursar's / Business Manager's Conference from the 18 - 20 November 2015. The FOBISIA Business Managers’ Conference 2013 was hosted by Tanglin Trust School, Singapore in September 2013. A welcome dinner for the delegates was held on the evening of Thursday 12 September at the Grand Copthorne Waterfront Hotel, where our CEO, Mr Peter Derby-Crook, welcomed the delegates from the various FOBISIA schools around the region. All the delegates attended a one and a half day conference at Tanglin Trust School over the next two days. This year’s programme included a presentation by DP Architects, a leading Singapore architectural firm, on “Sustainable Design Stories”. They shared with us how sustainable green features were incorporated into school buildings and landscape. In addition, International SOS, a leading medical & security assistance company, on "Travel Safe" shared how risk mitigation were incorporated into school trips and outdoor education. The delegates were then divided into groups for a tour of the school. The later part of the conference included a sharing session on best practices and topics which the delegates had put up earlier for discussion and this continued into another half day morning meeting at the conference hotel.